This study-day provides an introduction to the Old English verse riddles, which reveal so much about the Old English thought-world. We shall consider several in detail – how they work and their possible solutions. We shall see that many are best understood in the context of the genre of the poetry of wonder and wisdom. We shall also look at one the greatest of Old English religious poems, the Dream of the Rood – itself a kind of riddle – where the story of the Crucufixion is told from the unique perspective of the Cross itself. 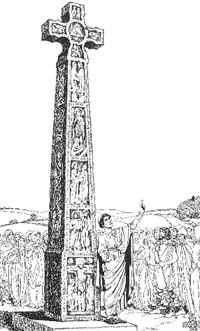 This wonderful text survives in several versions, including a runic one inscribed on the early eighth-century Ruthwell Cross (illustrated above).